Face: To achieve Maggie’s porcelain, flawless skin, I used Revlon Photoready foundation. If you need to hide under eye circles or blemishes, apply your favorite concealer, and set with powder. To achieve Maggie’s natural glow and tan, I lightly swept NARS Laguna Bronzer on my temples, hairline, as well as in the hollows of my cheeks and underneath my jawline, blending it out well, to contour. Maggie’s blush is a peachy bronze, so I chose to use a sheer peach blush, since blending my contour with a peach blush would create the perfect shade. I lightly swept Amazing Cosmetics Blush in Mucho Mango across the apples of my cheeks and blended up lightly towards my temples. Lastly, since Maggie’s look has a slight glow to it, I swept a highlighter above my cheekbones and temples, using Hard Candy Blush in Honeymoon (Hard Candy can be found at Walmart). Eyes: First, I applied an eye shadow base over my entire eyelid and across my lower lash line since we will be applying bronze eye shadow there. I used Too Faced Shadow Insurance. Next, I used a shimmery bronze eye shadow across my entire lid, just to the crease, using the bronze eyeshadow from the Smashbox Monarch Palette (limited edition, no longer available). Then, I blended just the edges of the bronze out with a blending brush to soften any harsh lines. Take a small brush, and apply the same bronze color to your entire lower lash line, being sure to blend out lightly. 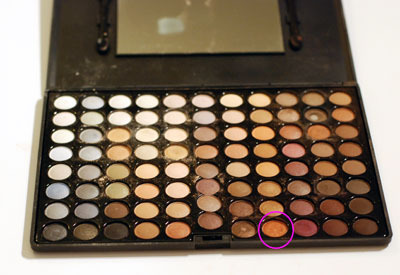 Next, apply a darker bronze or orange shade into the crease and corner of your eye. 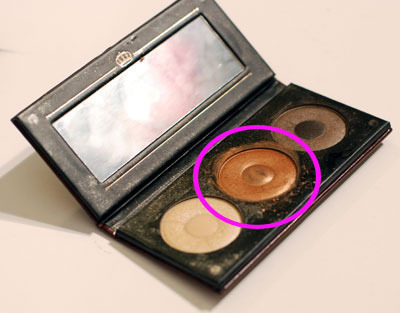 This will help the bronze color on the eye to stand out, and create definition. I used the Coastal Scents 88 Warm Palette for this. Since Maggie is not wearing any eyeliner underneath her eye, I swept a light brown eyeshadow into the outer corners of my lower lash line to slightly darken the bronze, and add dimension. Maggie is wearing a thin line of black liquid eyeliner on her upper lash line, but it does not extend all the way across her entire eye lid. I applied liquid eyeliner to my upper lash line, and stopped the line at the inner edge of my pupil, while looking straight ahead. This creates the illusion of thicker, darker lashes, without overpowering the bronze eyeshadow. Lastly, apply a matte (flat) white or beige eyeshadow just underneath your eyebrows as a highlight. Apply your favorite mascara to your upper lashes, and the outer corners of your lower lashes. Lips: Maggie is wearing a cool toned fuchsia lipstick. I lined my lips with a bright pink lip liner, and lightly filled in my lips with the same liner, so my lipstick lasts longer. I then applied Hard Candy Lipstick in Rush Hour to my lips. 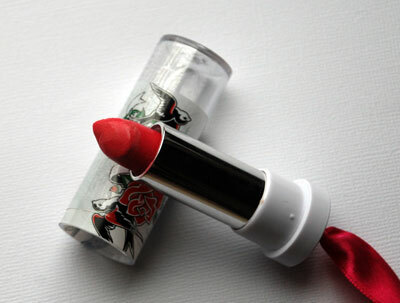 You can choose to apply your lipstick as sheer or as opaque as you want, slightly changing how dramatic the look will be. I chose to go as bold as Maggie’s and applied the color until it was traffic stopping pink! Hard Candy Lipstick in "Rush Hour"
For this look, you can use any products you currently have in your makeup collection, whether they are high end or drugstore. There are many different bronze eye-shadows and fuchsia lipsticks out there that will achieve exactly the same look. 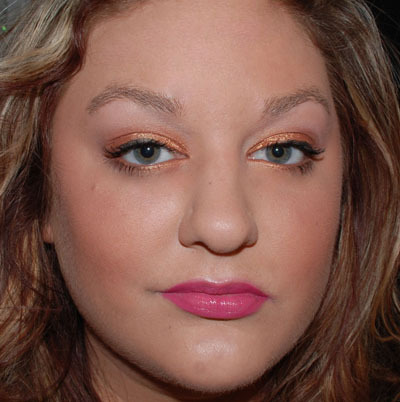 The end result is a makeup look that is both bold and fun, yet flirty. If you have any questions about this look, the products used, or substitutions for specific products used, please use the Contact form. If you would like to submit a look you would like to know how to achieve, please use the Contact Form. OH and btw, you look like Maggie! Gorgeous! I like the look..not sure if the eyeshadow would look good on me or not but I might try it..
Rachel, what color eyes do you have? 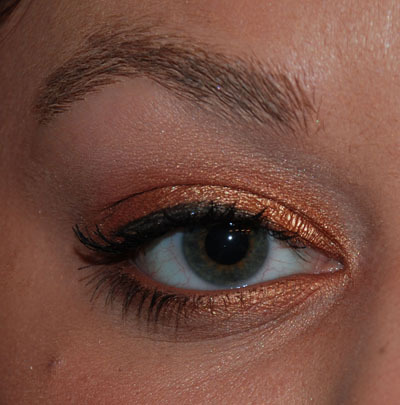 The bronze eyeshadow would look great on almost every eye color. It’s perfect for a smokey look that’s light and not too dramatic!